Let’s mix it up a little bit with this post. On a weekly basis I hear people say that they are just not seeing the results they want. If that’s the case, something needs to change. Don’t continue doing the same things and hoping the end result will be different. Here are a few things to think about if you have been working hard but are still frustrated with the lack of results. None of these are in any specific order, but just random from what came to mind. Enjoy! You’re not doing any soft-tissue work: Continuous break down and repair of the muscles can cause undesirable changes if not addressed. Foam rolling just a few days a week or getting a massage can help restore the natural qualities of your tissue. You’re great about putting the time into exercise, but you never let your body fully recover: Exercise without recovery is like preparing dinner without cooking it, you’re forgetting the most important part! The majority of our adaptations happen while we are resting and sleeping. Continued stress on the body can be detrimental in the long run. I’m not saying you have to take full days off in between workouts, but make sure you are alternating body parts to allow proper recovery. Oh ya, and get a good nights sleep! You don’t document your programs: Documentation is a key element to every exercise program. If you never document your exercises, sets, and reps, how do you know what to do next time? Okay, maybe you have a great memory and can recall exactly how much weight you lifted and how many times. But, how easy is it to pick up a cheap composition notebook at walgreens and record these numbers. If you’re not seeing results you can reflect back and see what exactly needs to be changed. You’re only doing cardio: Cardio is only half the battle! Studies have shown that people who only do cardio can actually gain weight. As we increase lean muscle mass with resistance training, our metabolism speeds up, which can lead to more calories burned in a day than that cardiovascular workout of yours. Plus, you can get a great cardiovascular benefit from implementing supersets or tri-sets into your resistance training routine. You never warm-up, cooldown or stretch: A proper warm-up, cool down and stretching are key aspects to any exercise program. The warm-up is essential to prepare the body for what lies ahead. It’s a time to mentally focus, increase muscle length, raise tissue temperature, and speed up nerve conduction velocity, which all decrease the chance of getting hurt. The cool down is a simple way to return the body back to normal after a tough session. A light jog or walk can lower the heart rate, and continue to circulate blood which will nourish the tissues. Then we get to static stretching, which no one does enough. I don’t necessarily think you’ll become more flexible, but definitely restore your muscles back to their resting length, which is huge in not losing range of motion. Your program contains so much variety that you never become proficient in certain movements: Depending on your exercise skill level, variety can be your best friend or your worst enemy. If you are a beginner or intermediate gym-goer, too much variety will definitely provide a good workout, but won’t improve your movement skill. It actually takes the neuromuscular system 4-6 weeks to become proficient in a certain movement before we actually see strength gains. So, take the time to repeat your program for 1-2 months while adding some serious weight. You have never been screened to identify any weakness, asymmetry, or imbalance: What areas do you need to improve most? I know you want to lose weight, get stronger, or feel better, but you place no emphasis on your weaknesses. Asymmetries and muscle imbalances can be strong contributors to future injury and can limit your success. Before you continue exercising, figure out how your body is functioning and address accordingly. Realize by improving upon your weaknesses you can further maximize your program. You use one full workout day each week to do arms: Bodybuilders will probably stop reading this post after #8. How often do I do arms? Almost never… And, why is that? Arms are involved in every upper body movement whether you realize it or not. We use the biceps for all pulling/back exercises, and the triceps for any pushing/shoulder/chest exercises. Of course, summer is right around the corner and you want to look great on the beach, but a full day of just arms is unnecessary. You haven’t set any goals: If you don’t have set goals, you can’t design your exercise program accordingly. When do you want to achieve these goals? Do you have a finish line in mind? Having set goals written down on paper is essential to designing the right exercise program. Don’t just go to the gym to do a series of exercises while assuming you are headed in the right direction. Set short-term and long-term goals, devise a detailed plan, and execute. You think exercise only happens in a gym: Exercise is anything that puts you in motion. Whether it’s riding bikes with your kids, gardening, hitting the gym, or playing basketball. I think we often get stuck into the idea of needing to be a member of a gym to exercise properly. Do you have stairs in your house? Walk up and down them. Do you live near a park? Jog around it or climb the monkey bars. Exercise happens anywhere and everywhere, so don’t limit yourself to this confining, unnatural place we call a gym. Try re-connecting with nature by exercising outdoors. Outdoor exercise can be beneficial by providing a different stimulus, and can actually help relieve stress. Oh yeah, and leave the iPod at home! Garrett McLaughlin is a licensed athletic trainer and personal trainer in Nashville, TN. He thoroughly enjoys helping people make improvements within their lives. 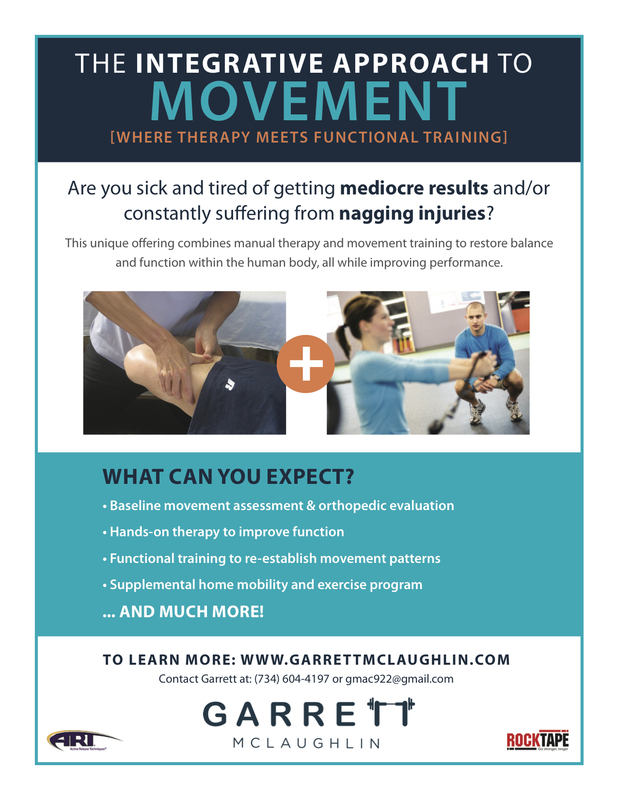 Aside from one-on-one personal training, Garrett is a certified active release techniques provider. ART is a soft-tissue manual therapy technique to quickly and safely restore the natural function of muscles, tendons, ligaments, nerves, and fascia.